July 1 raises the wage and the City is letting everyone know. Read all about it here and here. City enforcement includes fines when necessary to protect workers rights. The rules, available in the Download Center (to the right), contain enforcement policy and procedure. Click here to report a violation. Tina is a server at a restaurant in Minneapolis. On average, she receives about $8 an hour in tips. Does that count towards the minimum wage her employer must pay her? No, it does not. The employer must pay her at least the minimum wage--not counting tips or gratuities. ​An employee is any person who performs work for an employer for compensation, unless otherwise excluded by the ordinance. Persons who are exempt from the state minimum wage under Minnesota Statute Section 177.23 (the state minimum wage law) are also exempt from the Minneapolis minimum wage. Additionally, a) independent contractors and b) certain workers participating in a Minnesota Department of Employment and Economic Development program for persons with disabilities are also exempt from the minimum wage ordinance. Please note that the definition of employee in the Minneapolis Minimum Wage Ordinance is not the same as the definition of employee in the Minneapolis Sick and Safe Time Ordinance. Yes. Full-time, part-time, seasonal, and temporary staff, and persons who are jointly employed by one or more employers (e.g. employees hired through the services of a staffing agency or similar entity) can all be employees, if they fall into the definition above. Simply labeling someone an independent contractor does not make it so. Whether a person is an ‘independent contractor’ is determined on a case-by-case basis based upon a variety of facts, including the extent to which the independent contractor retains supervision, direction, and control over the work and the means to complete it. For more information about what makes an employee an ‘independent contractor’, please see the Minnesota Department of Labor and Industry website on that issue: http://www.dli.mn.gov/WC/IndpCont.asp. How much is the Minneapolis minimum wage? 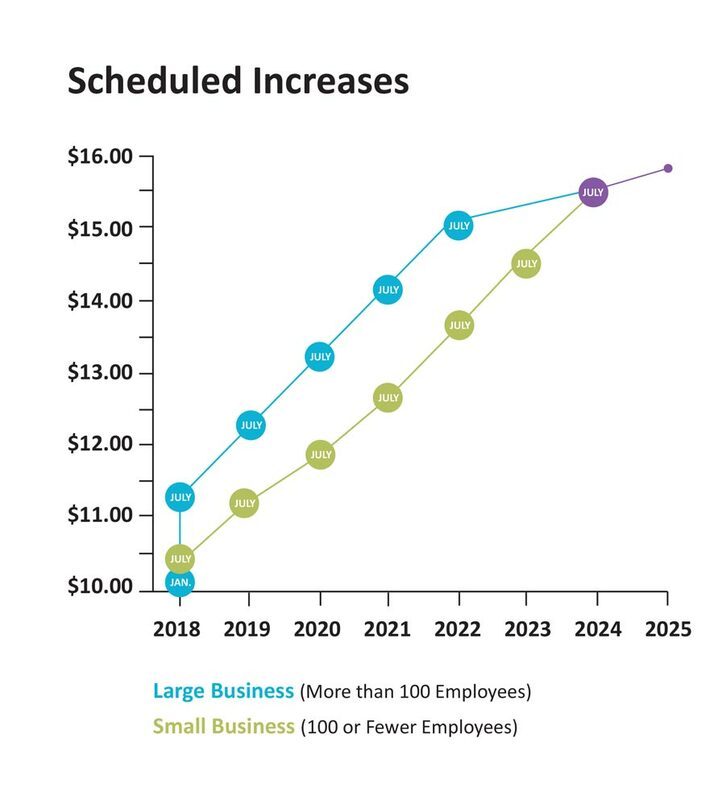 ​Until July 1, 2024, the minimum wage rate depends upon an employer’s size, as defined by total number of workers. The required minimum wage rate will increase until reaching $15 and then continue increasing yearly to account for inflation. See chart at the top of the homepage for more details. What is a “small business” under the new minimum wage ordinance? Employees are covered under the minimum wage ordinance regardless of their immigration status. The Minneapolis Department of Civil Rights will process an employee's report of suspected violation without regard to his or her immigration status. An employee filing a report will not be questioned about his or her immigration status. Additionally, if an employer were to suggest to a person that, if they file a wage claim or complaint, the employer will report suspected citizenship or immigration status of an employee or a family member to a government agency, this would be considered retaliation, which is also a violation of the ordinance. Any employee or person may report a violation of the Ordinance, using the Department’s “Report of Violation” form, to the Minneapolis Department of Civil Rights Labor Standards Enforcement Division online or in person at Minneapolis City Hall room 239. “Report of Violation” forms may also be requested and returned by U.S. mail or email. For more information (or to report anonymously), call 311 or email minwage@minneapolismn.gov. Employees may also seek a legal remedy in court independent of the City’s complaint process and at their own expense. ​Enforcement of the ordinance is the responsibility of the director of the Minneapolis Department of Civil Rights (“Department”). Enforcement is complaint based; however the Department also has broad authority to proactively investigate possible violations and issue fines as necessary to gain compliance. As in other types of labor law enforcement, compliance reviews and investigations may be utilized to identify all affected employees and protect the anonymity of complainants. Damages and civil penalties will be imposed to make employees whole. Administrative fines may also be imposed. Repeat or intentional violators will receive harsher penalties. Violations of the ordinance may also result in license sanctions, up to and including revocation of a business license by the City of Minneapolis. All legal options and penalties to gain compliance, including enforcement in a court of law, will be considered. Retaliation against an employee for exercising or attempting to exercise any rights available under the Municipal Minimum Wage Ordinance is strictly prohibited. Material changes in job duties or hours, formal disciplinary action such as documented warnings, or employment termination may be considered retaliatory. Aggressive enforcement to protect employees’ rights will be pursued by the Department in these types of cases.